As scarification, hairstyles to identify gender, ethnicity, stage reached by the person in the cycle of life, status and personal taste. Scholars, missionaries, settlers and travelers with an interest in Africa has been early aware of the diversity, richness hairstyles of men and women. In tests products on the subject, it appears that an important status was often expressed in a particularly complex hairstyle. As noted by many authors, styles changed: what was in fashion a year, or throughout a generation, giving rise to new forms, which would eventually be replaced in turn. Many styles represented in photographs and sculptures have now disappeared earlier. Unfortunately, most of this history is unknown. We can observe the present and what remains of the recent past. It should also consider the role of external influences (Europe) and internal (by interethnic exchanges) in the development of these modes. Whether in African life as in African art, hair has always been a part of the body which received the most attention and care. Status of biological component of the human body, hair has become a cultural component of social communication. The Eye Gallery and the Hand move, the exhibition "African Hairstyles, participate in recognition of this aspect of African art seldom considered or assessed. The field photographs and traditional sculptures offer a sample of the variety of hairstyles that exist or have existed in African life and art. Although today not all are visible on the continent, partly because of the influence of Western fashion, they continue to fascinate lovers of African art through works of sculpture. The Eye Gallery and the Main, directed by Armand Auxiètre, has since 2004 a series of exhibitions on topics essential to African art. Located in the heart of the Carré Rive Gauche, between the Musee d'Orsay, the Musée Rodin, Maillol Museum and Saint-Germain-des-Pres, the gallery enjoys the special atmosphere of this famous antique district. The gallery's name was chosen in homage to the artists, mostly anonymous in the field of traditional African art, who create and give life to the material through their spouse and their hands look. Temporary exhibitions are held regularly and offer the opportunity to offer in terms of fans and collectors items that meet a theme constantly updated. Armand Auxiètre has always been steeped in the world of collectibles. His grandfather and father before him have made, and as far as time and discovery, a collection of many and varied works from ancient objects from all parts of Africa. From an early age, Armand operates in a particular universe, in which it educates its natural look. After spending several degrees cabinetry, he successfully graduated crafts at Ecole Boulle and develops parallel knowledge in African art. The attraction between African sculpture and Armand Auxiètre plastic is first, immediate, obvious. A love is born, which will be developed over the meetings, discoveries and readings. Soon the pleasure of being surrounded by parts becomes too great to resist the urge to share this passion, Armand is the old library of her grandmother, and perpetuates the family presence initiated in 1950 at 41 rue de Verneuil , creating the gallery "The Eye and the Hand." The interest of Armand Auxiètre for Contemporary Art, which recently led to reinterpret the theme of curiosity cabinet by creating a space in the loft Ohlala restaurant in Paris, has manifested itself in 2005 in collaboration with visual artist Adrienne Jalbert as well as exhibitions of contemporary photography on the theme of Africa. This will break the anchors of times, techniques and materials is omnipresent in the minds of the creator of the gallery, thus making it a place to express both his passion for Africa, but also the cultural and artistic diversity of the continent. Among primitive art galleries Carré Rive Gauche, the gallery's eye and hand is distinguished by the primary concern during each exposure, to offer collectors, but also to the general public, a set of parts of a high aesthetic quality and historical importance. 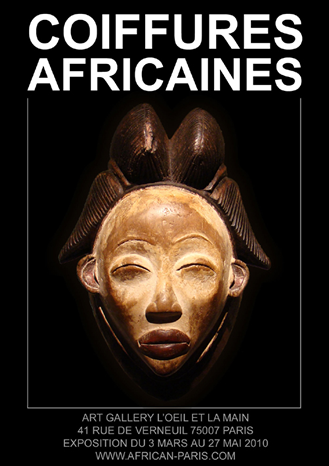 Located in the historic Paris and in a charming old building, the Gallery of African Art The Eye and the Hand presents a selection of works of high quality plastic, it is good long look. The gallery offers an approach that is both erudite and sensitive to African art. Some will simply admire these works for their artistic beauty, others are more curious about their origins. The cultural program of the gallery also reflects a desire not to be confined to subjects "any facts" but to propose a reflection on various themes, sometimes cutting, common to African arts. Rather than show objects in a "museum", the gallery's eye and hand implements original exhibitions which, by their reading levels, may arouse the interest of a wide audience.